MIAMI, FLORDIA - No one actually knows if Birdman would run up on Rick Ross and Trick Daddy as Charlamagne Tha God suggested. But if a photo from last night is any indication, Lil Wayne is on good terms with his fellow southern rap heavyweights. 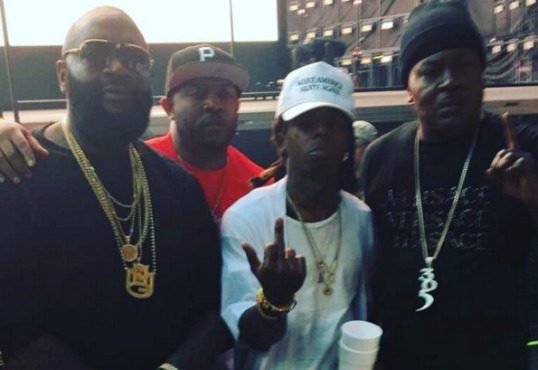 On Wednesday night, Ross posted a photo on Instagram with himself, Mack Maine, Lil Wayne (complete with the middle finger) and Trick Daddy standing side by side. The photo was taken at Marlins Park in Miami, which kicked off Beyonce's global Formation World Tour. He also posted a photo with just him and Trick Daddy. When Birdman chastised The Breakfast Club hosts for not putting “respek” on his name, Charlamagne responded by asking if he confronted Rick Ross and Trick Daddy the same way. Trick Daddy questioned Birdman’s dedication to business in light of other focuses, said he claimed allegiances to rival gangs, Ross used the radio show to voice their support for Lil Wayne during his $51 million lawsuit against Birdman. As a response to Birdman’s tumultuous visit last week, Ross sent Charlamagne bottles of Belaire Rose. Trick Daddy also responded to last week’s tantrum during a show in Dallas, bringing up the interview and playing his hit “Nann” afterward. Birdman, meanwhile, has allegedly apologized to the Breakfast Club hosts and announced the impending release of a Lost At Sea mixtape with Cash Money signee Jacques.